Get ready for a day full of wildlife-saving fun at this year’s Party for the Planet presented by CenterPoint Energy! On Saturday April 20th from 9am to 3pm you’ll have the opportunity to explore the Zoo and participate in a number of exciting games and activities, discovering some of the many ways you and the Zoo are helping to save animals in the wild. 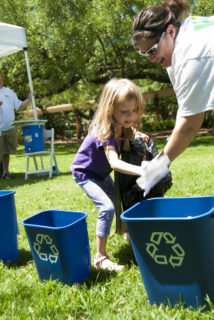 Grab a friend and put your recycling skills to the test in our “Race to Recycle”! We’ll provide you with various items and you’ll guess how each needs to be recycled. It may seem like just fun and games, but you’ll walk away having practiced a wildlife-saving skill you can use every day. The more items we recycle, the more waste we keep out of landfills. This means we need less room for landfills and there’s less of a chance that debris will find its way into wild habitats, saving species like the porcupine! Once you’ve become a recycling pro, you can take your knowledge to the next level in our “Jelly or Junk” challenge. Hungry sea turtles love to snack on jellyfish, but sometimes they can mistake a plastic bag for a jellyfish – can you tell the difference between the two? JUST Water will have reusable grocery bags for you to take home so you can go plastic bag free to save sea turtles just like the Zoo! 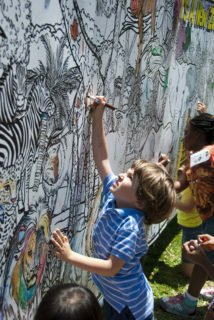 Show off your artistic talent and save black bears by adding a splash of color to our giant reusable mural! Yes, you heard that right – there’s a giant, paperless mural featuring all of your favorite animals just waiting for you at the party. By reducing paper use, you help save trees that black bears need to survive, and your artwork will make for a great photo-op! Don’t worry, the fun doesn’t stop there. During the party you’ll have the opportunity to meet a member of the Zoo’s horticulture team and help with a ladybug release! The Houston Zoo plants pollinator gardens around the Zoo to give homes to bugs like ladybugs and butterflies. 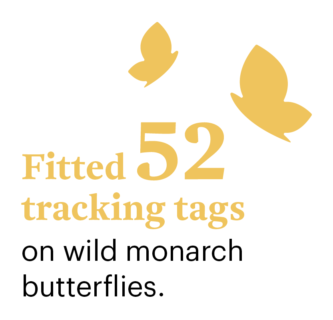 Just last year, the Zoo fitted tracking tags on 52 butterflies – tracking our pollinator friends helps us to protect their migration routes, ensuring that their populations stay healthy. Thanks to CenterPoint Energy and Trees for Houston, you can take the party home with you by picking up a free tree seedling and planting it in your yard! By planting and caring for your tree you’ll be providing a safe home for wild screech owls for many years to come. Just by coming to the Zoo you’re protecting animals in the wild, so what are you waiting for? Join us and sing, dance, and play the day away – we can’t wait to party with you! Find more information on Party for the Planet here. Share via Facebook: Celebrate Earth Day and Save Species at Party for the Planet this Weekend! Share via Twitter: Celebrate Earth Day and Save Species at Party for the Planet this Weekend! Share via Linkedin: Celebrate Earth Day and Save Species at Party for the Planet this Weekend! Share via Email: Celebrate Earth Day and Save Species at Party for the Planet this Weekend!